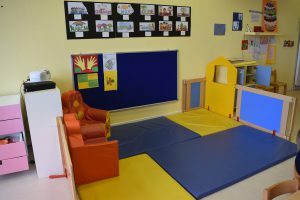 The Cap Canaille daycare center has been in the Villars-sur-Glâne area for over 10 years! Welcoming children from 3 months and up until they start school as well as their families in a warm and friendly atmosphere. The daycare welcomes 60 children Monday to Friday from 6:30 am to 6:30 pm in a multicultural setting with bilingual English – French professionals. Located near the Moncor forest, the daycare is open all year, closing only during official Fribourg Canton holidays as well as 2 weeks between Christmas and the New Year. A team of early childhood professionals work alongside families to guarantee the well-being and health of children in a safe and secure environment. A private garden and many excursions for the older children in the area, allow children to enjoy outdoor activities. Come for a visit we would love to meet you!